Good morning to you all and thanks for dropping by. Today it is time for another card from our friendly little group who make our Christmas cards throughout the year so that we don't have a mad panic close to the time. If you would like to join us please let me know. You can find the blogs of my other CCC pals on my right side bar. The lovely Lorraine has chosen for her theme this week "Jolly Santa". I have kept my card simple and flat enough for minimum postage. I think Santa and his two pals knew the theme this week because they are all smiling. The weather is still bitterly cold and although we don't have the amount of snow forecast I think this a day to be spent inside crafting. As if we need an excuse !!! Labels: Cheery Lynn, Creative Expressions, Cuddly Buddly. 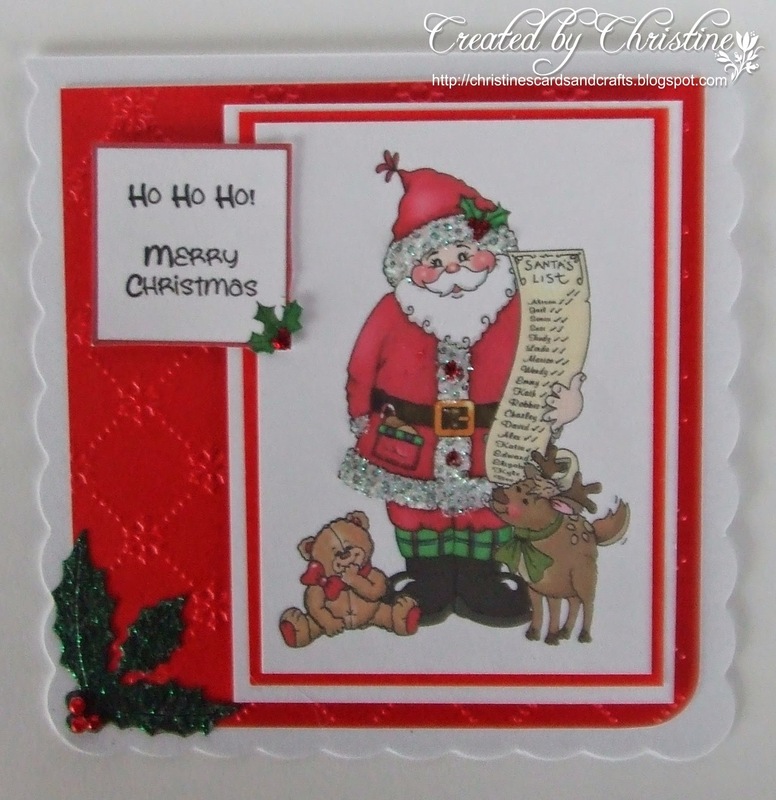 Great card, love the Santa image, colours and your great design. Lovely image and great design, love it. Gorgeous card Christine, I love the jolly Santa and fabulous colouring. A gorgeous jolly image for my theme this time Christine. Lovely embossing and holly details too. Hope the weather stays kind to you there. beautiful red and bright Christmas card. Your Santa looks very jolly too. Hope your snow has gone. Hello Christine, gorgeous card, I love the jolly image, and your colours. Baltic here, but still managed a walk in Daviot forest, cleared the cobwebs away. Bright, festive & fun. Lovely coloring, and the image is just so cute. Good choices with the red & white - the layering reminds of the peppermint candy striping of the season. Loved the holly leaves trimming the corner and the pretty scallop edges. TFS & Hgus. A super happy looking trio. great image. I love that holly corner. Stroking the screen as we speak.!!lol. hugs Mrs A. Looks like the size of my grandkids lists!!! And a fine jolly Santa he is too! Don't you just love that embossing folder? How often do I apply the goose fat and brown paper then hahaha? Oooh I lurve this one Christine - do you think the teddy is giggling at the very smart tartan tops on Santa's wellies???? No ? - perhaps it's just me then! lol. Very bright and cheerful! Very cute! Great layout for this image and I love that embossing folder you used. Thanks for playing with CHNCC2. Hi Christine, love your beautiful Christmas card design, fabulous image and layout. Dad is pretty good of late, we are still seeing him each day and he loves it.